Pinoy artist Edward Neibert III re-imagined our favorite childhood heroines! The Disney princesses (including queens and honorary royalty a.k.a. Mulan) come from all over the world: the Middle East (Jasmine from Aladdin), Scotland (Merida from Brave), and Arendelle, the fictional country of Elsa and Ana from Frozen. We have yet to have one from the Philippines, but a local artist hopes that will change soon. To celebrate Buwan ng Wika, artist Edward Neibert III reimagined the beloved characters as beautiful Filipinas dressed in various Philippine traditional attire. "The idea came to me out of curiousity and desire to see the Disney princesses wearing our national costumes, even from our country's diverse ethnic groups. I guess it's also my way of saying that it may be time for Disney to make a Filipina princess!" Neibert told SmartParenting.com.ph via Facebook. In addition to the Filipiniana and baro't saya looks, Neibert took inspiration from the Ifugao, Muslim and T'boli culture as well as the clothes the women wore in the paintings of National Artist Fernando Amorsolo. Above is Princess Aurora and Prince Philip from the Sleeping Beauty in baro't saya and barong Tagalog. We like how Neibert changes the colors of the characters' hair to darker shades. Doesn't the prince look dashing in his embroidered formal wear? Below is Princess Jasmine as a Muslim princess, looking as beautiful as always in her signature color, aqua. "I've been a big fan of Disney ever since I was a kid, particularly of the Disney princesses," said Niebert. "They empowered women, which in my eyes back then (until now) was really cool." His favorite among the royalties is Tiana. "I like how independent she is and how fiercely she fights for her and her father's dream, which is admirable in a world where people are easily swayed." Befitting her role as a warrior, Neibert reimagined Mulan as one of the brave men who fought for our country's freedom from the Spanish occupation, a Katipunero! Here is Belle from Beauty and the Beast in an everyday terno. With the blue kerchief and white blouse, she certainly reminds us of Amorsolo's "Palay Maiden." Niebert had gushed about his admiration for the artist, saying, "It's perfect how he captures women in both a delicate and strong manner." As of writing this article, the artworks, which were posted on Neibert's public Facebook page Edwardo Todd, have been shared over 4,200 times. Comments have expressed admiration and enthusiasm for Neibert's work with one even suggesting that the Pinay version of Belle fell in love with a Filipino mythical creature in place of the Beast. Tikbalang or kapre? Here are more princesses in Filipinianas and the baro't saya terno. 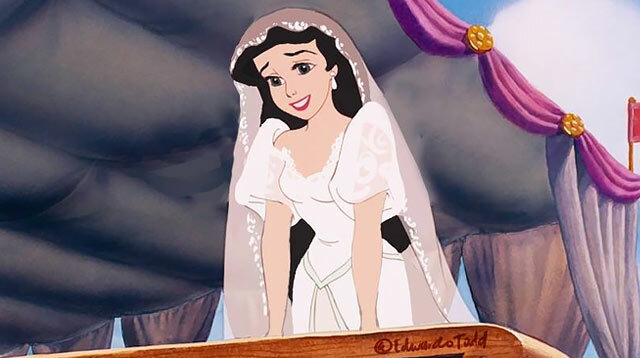 See Ariel in a wedding dress and darker colored hair. And, Cinderella in a ballgown—no longer blonde and with morena skin. Plus, Snow White in a baro't saya terno with the same dark colored hair only longer. Here's another version of the princess that Neibert drew a few months back. We like how this one shows more of his art style. She retains her snow-white skin but she looks dainty and very much like a binibini in her terno.